Ever since our lovely employee Erica took on our clothing department, it looks better than ever! She combs through daily shipments of clothing and hand picks the finest in men’s and women’s wear. This also includes accessories such as high end designer purses, quality footwear of all sorts, seasonal garb, new fashions, vintage and even antique clothing. All sold at incredibly fair prices. The fitting room is located right in the clothing section for convenience and privacy. We put new items on the floor twice a week — and it goes fast — so it is recommended that you come in often to find the finest picks. 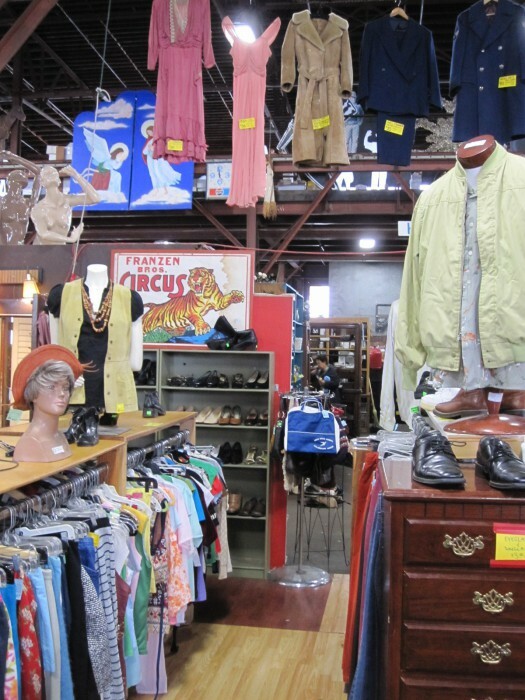 Feel like trying on one of our antique clothing items hanging way up high? Just ask any one of our employees for help. They'll gladly bring any piece down for your perusal. I read about Dan Knapp /Urban Ore in Audubon way back in 1993….so very pleased to see he is still operating…..go man!!! Thanks, Edith. Dan is still going and going and going strong. Thanks for remembering the Audubon article, which featured a photo of Dan including Sam the Dog, who Dan rescued from a vacant lot Urban Ore Building Materials had to live on for a year between good sites. Sam worked as an Urban Ore guard dog for several years but figured out how to escape at night, and then figured out how to get to Dan’s house. When he beat Dan home from work, he became a pet who worked in the day and went home with Dan at night.